Global growth is expected to continue and yields should rise over the year. In the first edition for 2018, we cover our views for the year. Global investment market volatility to rise from Q3 2018 onwards – 2H investment market returns could turn negative. Australian interest-rates will remain unchanged through the 1H of 2018. It is possible we see a very modest RBA tightening cycle commence in Q4. Strong US economic momentum at the turn of 2017 has had a knock-on effect to European and Asian economies, and 2018 shapes as the likely best year for global economic activity since 2011. US tax cuts are driving much of this optimism and will have manifold positive implications for investors in the very near-term. First, US corporate earnings are likely lifted by as much as ~10% from the decision to drop business taxes from 35% to 21%. Second, the combined impact of both business and personal tax cuts will lift near-term economic demand. Even more than this, the shift to fiscal stimulus, particularly as ‘Quantitative Easing’ nears its end, is sure to trigger a wave of similar actions from governments around the world, including Australia, where unbeknown to most, we have become the 3rd highest taxed nation in the OECD. Malcolm Turnbull should feel hugely thankful for the U.S tax cut legislation since it will provide a policy platform upon which he can jump, in the lead up to our next Federal Election in May 2019. Previously lacking a core point of differentiation, the Liberals are now well-placed to sell themselves to the electorate in 2018 as the party for tax reduction, unlike Labour, who are still fundamentally wedded to policies involving higher business taxes and the repeal of negative gearing. Local share-markets would welcome a continued Liberal federal government. Also encouraging for local investors is the prospect for positive earnings momentum. The latter half of 2017 saw local economic activity improve markedly, with services and manufacturing continuing to gain, and construction stabilizing. Where full-time employment growth was hard to find in 2016, it flourished in 2017 and it is likely that over 300,000 new, full-time jobs were created (growth of +near +4%). Where we started 2017 cursing the record high levels of underemployment, we are now encouraged to see the economy absorbing more job-seekers, and with that, wages should slowly begin to creep up from their 20-year low. So, in all, we start the year with optimism. With the global economy in full-swing it would be easy to get carried away with optimism, but first let’s remember that this hasn’t been a typical investment cycle. Global monetary stimulus has been at an unprecedented rate since the GFC, fuelling ever higher asset prices. Roughly US$10 trillion of stimulus has been added by the three largest central banks (U.S Federal Reserve, European Central Bank and Bank of Japan) in the past decade, and this stimulus is rapidly coming to an end. The U.S Federal Reserve have timidly commenced their balance sheet reduction, but it will gather a meaningful pace by mid-year. Alongside this, the European Central Bank will cease its money-printing by September, removing a stimulus that has forced a huge swathe of European government debt onto negative interest rates (German and French government bond yields are negative out to 5-years). In addition to the risks associated with weaning global asset markets from the central bank teat, bond markets globally are likely to be forced to deal with rising inflationary expectations for the first time in well over a decade (or more). Oil prices are now +40% higher than where they were a year ago, industrial metal prices are +25%, the U.S unemployment rate has collapsed to 4.1% (only just off the 50-year low-point of 3.8% recorded in the middle of the 2000-2001 tech-boom, and Asian and European unemployment indicators are similarly falling. There does seem increasing potential for a global bond market ‘re-set’ to higher yields, reflective of strong economic fundamentals and the diminishing impact of central bank buying. Though it’s anyone’s guess how this plays out, higher bond yields seem the single most obvious asset market risk in 2018. The other important reminder for investors in 2018 is to remember just how deep into this bull market we now are. 2017 marked the 6th straight positive year for Australian share-market returns, and in the U.S the positivity extends to be virtually 9 years if you ignore the two years the S&P500 was flat. Global share-markets are up +180% since the end of 2008 and global bond yields have collapsed in half on their pre-GFC levels (using US 10-year bonds as a proxy). We have had some good times. 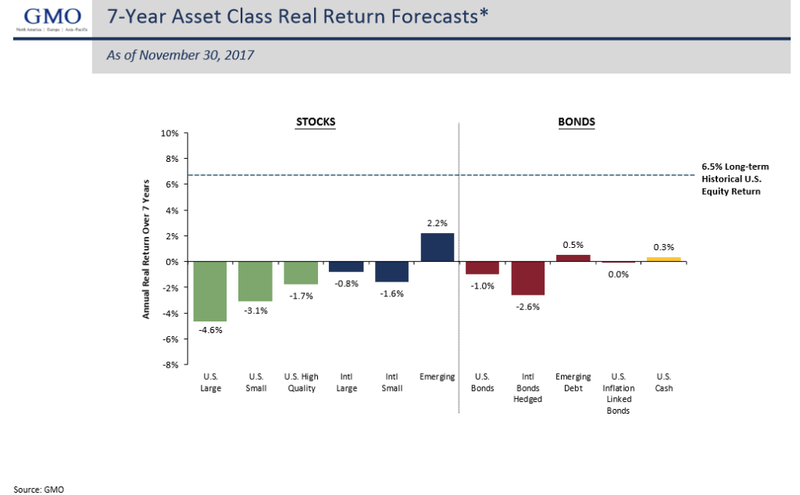 Global value investment manager GMO publish their expectations for expected annual returns over the coming 7-years across major asset classes each quarter, and I have included their most recent assessment (November 30 2017) below. GMO calculate these returns based upon an expectation that all asset valuations revert to their mean, taking data that goes back multiple decades and in some instances centuries. Only cash and emerging market shares and debt look set for positive annual returns in the upcoming 7-year time frame according to GMO’s assessment of historic pricing. The analysis above is worth bearing in mind. Though economic growth is strong and arguably getting stronger, it is important to recognize that we are deep into this investment cycle, significant gains have indeed already been made, valuations are already on the high side and the monetary stimulus punchbowl is slowly being wheeled away. But for now, we keep dancing. Markets will be strong in the 1H of 2018 before facing rising uncertainty as we approach the third quarter. Tax stimulus will be a positive tailwind in the U.S, and the promise of tax cuts will similarly fuel markets in other jurisdictions such as Australia. To gain exposure to this momentum, we advocate for clients to raise their exposure to domestic Australian cyclical shares, and have recommended holdings in each of SEEK (SEK), Downer Group (DOW), QUBE Holdings (QUB) and APN Outdoor (APO). We expect earnings upgrades in all of these companies during 2018, and have already seen SEK and DOW raise earnings guidance as recently as November 2017. Removal of central bank monetary stimulus and rising risk of emergent inflation stand as the two key risks for bond-markets and indeed for asset markets in general in 2018. We see these risks escalating as the year progresses. In recent month’s we have reduced our Australian share exposures to interest-rate sensitive stocks, notably taking profit in bbbb several months ago. Our Fixed Income models have also reduced its exposure to long-term bond yields in large part, and endeavoured to steer as much as possible toward floating rate interest exposures such as MCP Master Income Trust (MXT), La Trobe Financial 12-month Term Account (LTC0002AU) and bank hybrid securities. With greater uncertainty likely to emerge in the latter half of 2018, we are also recommending clients shift their exposures from ‘passive’ index-tracking strategies to more ‘active’ managers on the basis that active funds management groups will add value to performance as asset prices near their peak. We feel really strong this will prove the case, and in particular we have reduced our exposures in the International Equities models to Vanguard’s International Share fund (VGS & VAN0003AU) to make way for active managers such as Magellan Global trust (MGG), Magellan Global Fund (MGE & MGE0001AU), Antipodes Global Fund (IOF0045AU), Orbis Global Equity (ETL0463AU) & Platinum Asia (PLA0004AU and PAXX). Finally, we continue to believe that international equity markets will outperform their Australian counterparts in 2018. In 2017, the MSCI World (unhedged) returned +13.3%, beating the ASX200 Accumulation returns of +11.8%, but this was done in spite of a 10% rise in the Australian Dollar, against our expectation. With the AUD nearing 80c, we feel less concerned about the risk of further gains. Australia’s share-market index is heavily biased to old-economy, defensive earnings and will be hard-pressed to match the level of economic sensitivity available to stocks in each of Europe, Asia and the U.S.
Investment markets should perform well in the first half of 2018, buoyed by global economic optimism and associated earnings upgrades. We think it’s possible to see Australian shares push higher to near the ASX200’s late-2007 peak of 6750 – a rise of almost +10% on current levels – before shares likely consolidate toward the end of 2018. Clients should be raising their exposures to domestic cyclical shares such as SEEK (SEK), Downer (DOW), APN Outdoor (APO) and QUBE Holdings (QUB). As the year draws on and asset markets climb higher, we will likely advocate for increased caution, however we are alive to the risks of an unexpected inflationary spike sooner than our base case might anticipate. Global bond markets remain a particular area of caution for us in 2018.